Experience live, the talent of four Bay Area artists, as each transforms the night-time stealth of urban graffiti into Spray Paint Art on 4′ x 6′ modules of Painter’s Canvas. Sponsored by Blick Art Materials and Montana Cans. Estria Miyashiro: San Francisco’s Original Old School. Estria began spray painting in Hawai’i in 1984 and has since painted hundreds of murals. He was an influential leader of the “Golden Age” of graffiti (1980´s) in San Francisco, pioneering painting techniques of characters and scenes. He is also one of the originators of the stencil tip, a modified cap used by graffiti writers to create thin airbrush-like lines. Estria has painted in Peru, Italy, Mexico, Japan, Honduras, New York, Los Angeles, Honolulu, Charlotte and San Francisco. Since 1993 he has taught graffiti classes and lectured at universities on graffiti´s social and political impact. He garnered national attention with his arrest for graffiti in 1994; appearing in CNN, the San Francisco Chronicle and Examiner, and the National Enquirer. Estria co-founded Tumis Design in Oakland, California, which develops graphic communications and web applications for non-profits and foundations. Estria´s clients prior to Tumis include Sega America, MTV, Toyota, McKesson Corporation, Nokia, the Mills Corporation, President Clinton, and McDonald´s. Estria also co-founded Visual Element, the EastSide Arts Alliance´s free mural workshop that develops youth as a voice of the People. He has served the community through his cultural work for over 25 years. Samurai Graphix is a custom screen-printing company in San Leandro, CA, founded by Estria in 2007 to serve local businesses, bands and schools. He is currently creating screen prints for Hip Hop concerts. Jared Roses, age 25 is a painter/muralist from the Bay Area. At a young age he began to draw from comic books and was inspired by all the graffiti artwork in the Bay. Being a skateboarder and musician in middle and high school had a big impact on him as well. Music and Skating culture really opened Jared up to a unique and creative community of people. “I love painting to jazz music is my favorite way to paint because its’ so loose, and takes you new places.” Working on canvas, walls, wood and other various surfaces Jared’s main mediums include acrylic, oil, spray-paint, ink and more. 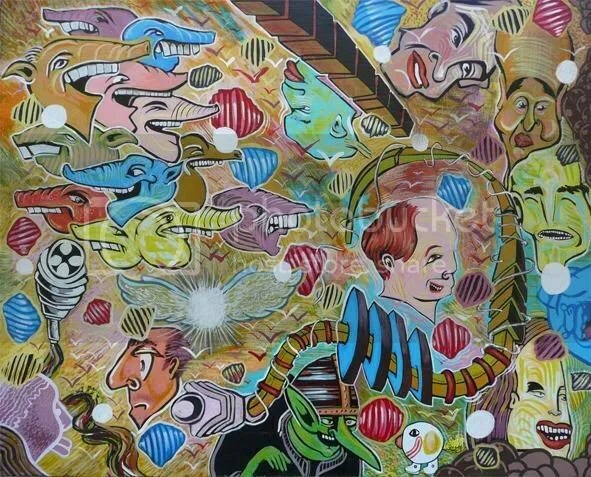 Jared has a unique painting style infused with bright vibrant colors, psychedelic worlds, graffiti, ethnic art, Buddhist art, Hindu art, Latino/Aztec/Mayan art, emotions, spiritualism, and humor. For the past 10 years Jared has painted many murals northern California, displayed/installed and sold work in Bay Area galleries, graphic design projects for bands and companies, newspaper write ups, and has networked with many other talented artists here in the Bay Area. Max Ehrman Eon75: He has been painting for over 12 years. Through graffiti, he has traveled and created murals all throughout Europe and American. Currently he has presented Canvas work in 4 different countries and has personally organized 3 art shows in Naples Florida with the Journeyman Gallery. He has sold canvas work here in the United States and also in Berlin, Antwerp and Barcelona. Once a year he travels to Europe to paint with friends at several Graffiti/Hip Hop jams in Germany, Holland and Belgium. Through his travels, he has made some great friends as well as been lucky enough to paint with some very talented artists. I got started with art as a child. I’ve been surrounded by art my whole life. I can’t hide from it. I love it. Art feeds my soul. Mel Waters, being born to both Filipino and African-American parentage, grew up with a strong, unending desire to do art by being inspired by his own “portrait” of life experiences. With an unbreakable support system from family and friends, Mel seeks most of his artistic subject matters for his work from within the soul that coincides with his life experiences with the human condition that transforms his abstract style. Most mediums Mel enjoys utilizing to create his work include the use of pencils, acrylic, oil, and spray paint. His most popular work includes murals for Jason Britton and pink’s husband, Cary Hart. The East Bay Express invites you to the Best of the East Bay Party, a celebration of everything great about the East Bay! Check this blog frequently for announcements. A full event program guide will be inserted into the Express on Aug. 5. See you Friday, Aug. 7, at the Oakland Museum of California.